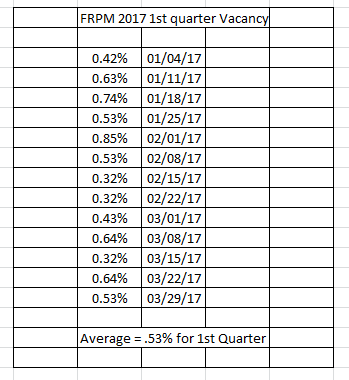 After posting the NARPM 1st quarter vacancy last week, we wanted to take a minute to share FRPM's 1st quarter vacancy results for 2017. 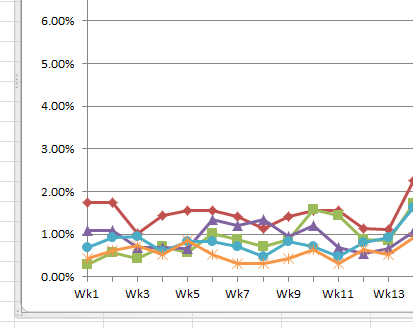 The overall average for FRPM was .53%. 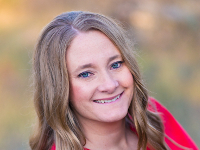 This is for multifamily and single family homes. This continues to be a record low for the past 5 years. Below is a graph with the 1st quarter vacancy for 2013-2017. The orange line represents the vacancy for 2017. As you can see the trend of low vacancy is still going strong.